Me and my sister used to go to Sunday School every Sunday, it has to be said that the religious side of things passed us by because we were more interested in what we'd spend our 10 pences on in the sweet shop after it finished. You could get quite the haul from the local sweet shop at the end of the 70s! Not sure how much Daisy's collection of sweeties cost but she is definitely enjoying them. 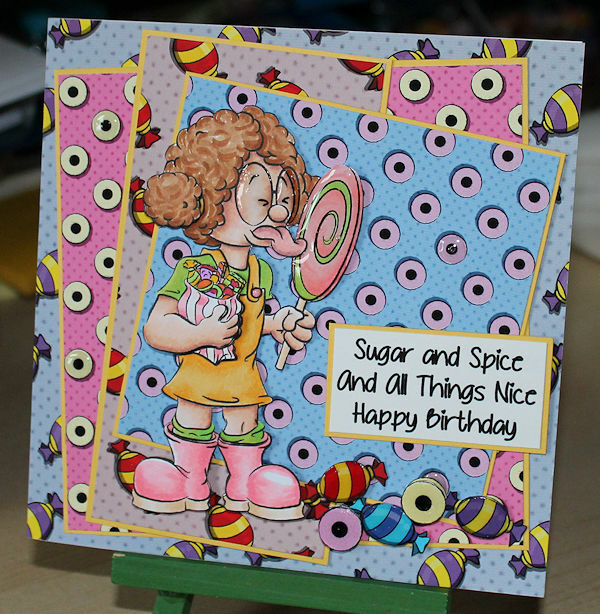 Candy Daisy is Dr Digi's latest creation and can be found HERE, I also used Candyland papers which can be found HERE. Oh! I did laugh, fabulous colours with her too.